Kinabalu National Park is the 1st UNESCO World Heritage Site of Malaysia and the only one for Sabah. 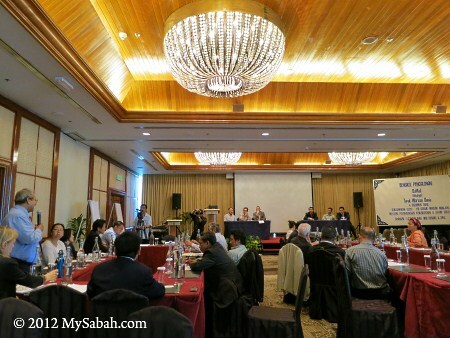 The good news is – DaMaI would become the next and second World Heritage Site of Sabah, and the bad news is – we have to wait until year 2017 or later, as informed in the World Heritage Workshop held in Shangri-La’s Tanjung Aru Resort & SPA on 4 Dec 2012. 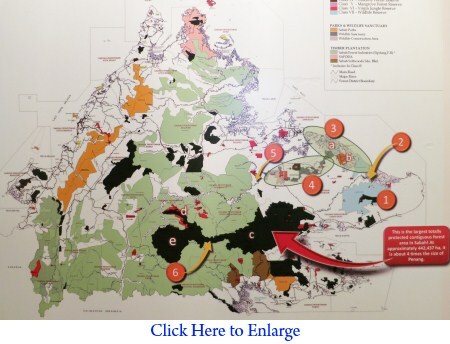 DaMaI is a totally-protected forest reserve managed by Yayasan Sabah Group and is larger than Penang state. Spanning an area of nearly the size of two Singapore and with an altitude ranges from 75 M to 2,000 M, DaMaI contains the richest flora and fauna species of Borneo. 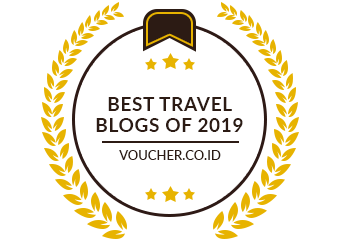 It is the home to over 15,000 plant and 350 bird species, and some endemic Borneo mammals such as Orangutan, Proboscis Monkey and Bornean Pygmy Elephant. The Workshop was officiated by Datuk Masidi Manjun, Minister of Tourism, Culture and Environment (Sabah), who stated government would give full support, even financially, to make DaMaI the next World Heritage Site (WHS) of Malaysia. 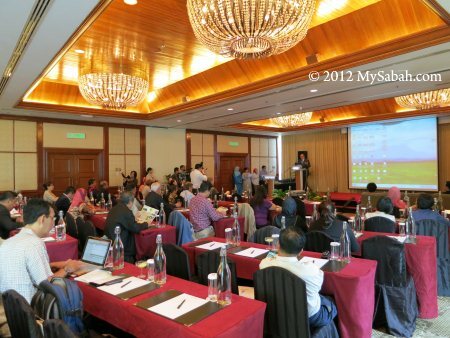 There were about 60 stakeholders from government, NGO and tourism sectors attended this workshop. Pic: Momento to Datuk Masidi (middle) by Dr. Jamili Nais (right), chairman of DaMaI Working Committee, and Dr. Waidi Sinun (Yayasan Sabah). The goal of this full consultative workshop is to gather input from stakeholders to finalize the Nomination Dossier for DaMaI, with the aid of Working Committee formed by members from Sabah Parks, Yayasan Sabah, Sabah Forestry Department, University Malaysia Sabah, etc. I’m glad to be part of this. 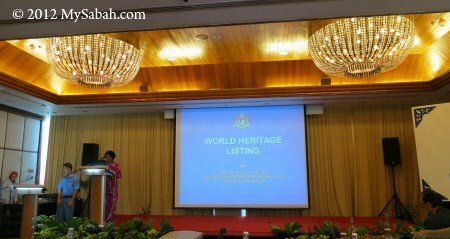 The first requirement for DaMaI to qualify for WHS application is – DaMaI needs to be accredited as a National Heritage Site by Malaysia government. That’s why Department of National Heritage (Jabatan Warisan Negara) Director-General, Assoc Prof. Datuk Paduka Siti Zurina Abdul Majid was there to explain the process. After the briefing and presentation in the morning, we split into 5 groups to discuss on different chapters of the Dossier and to give our feedback. I don’t want to go into too much details on this. In simplest explanation, this Dossier is the documentation and management plan of DaMaI, written in format set by UNESCO. 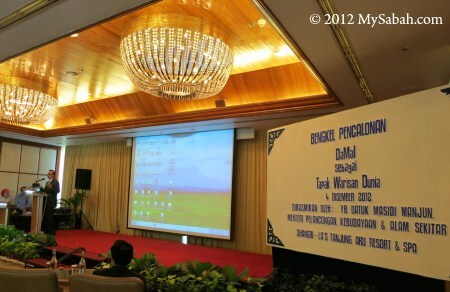 The finalized and complete Nomination Dossier will be submitted to Department of National Heritage by 15 Dec 2012, to include DaMaI in Tentative List of Malaysia. Tentative List is an inventory of sites that Malaysia plans to nominate as WHS in next 5 to 10 years. 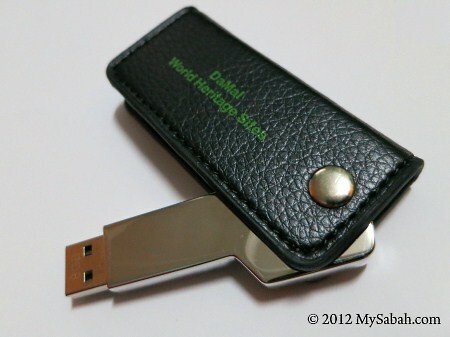 For more info, please visit the web site of World Heritage Center. As the first step of nomination, DaMaI must be listed in the Tentative List. The WHS application takes about 18 months. FYI, Malaysia becomes a member of WHS Committee in 2011. 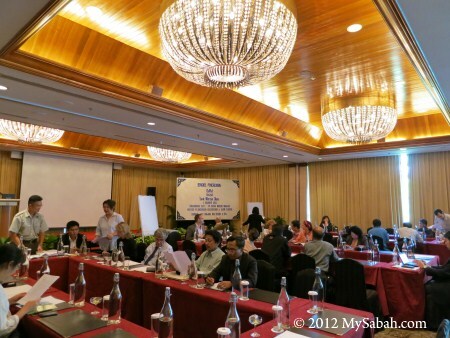 WHS Committee consists of members selected from 20 countries, and this is first time Malaysia joining this committee. It’s quite a privilege and good experience to learn about WHS application. However, to avoid conflict of interest, as a member, Malaysia is not allowed to nominate any Malaysian site as WHS. According to Department of National Heritage, the proposal of DaMaI as a World Heritage Site can only be made in 2015, the year our membership ends. That means DaMaI needs to wait until 2017 or later to become a WHS, provided that the application goes well. As of 2012, there are 962 World Heritage Sites in the world (69% cultural sites and 20% nature sites). Since there are nearly 1,000 WHS now, UNESCO is more selective and they look for sites that can fill in the gap. One of the most important deciding factor is whether DaMaI has any exceptional uniqueness and quality (Outstanding Universal Value) that is different from other WHS. For example, DaMaI has excellent rainforest, but it shares a lot of similarities with Tropical Rainforest Heritage of Sumatra, a WHS which is nearly 20 times larger (2.5 million hectare) than DaMaI. Though I’m optimistic, I’m not 100% sure if DaMaI will become our next WHS. 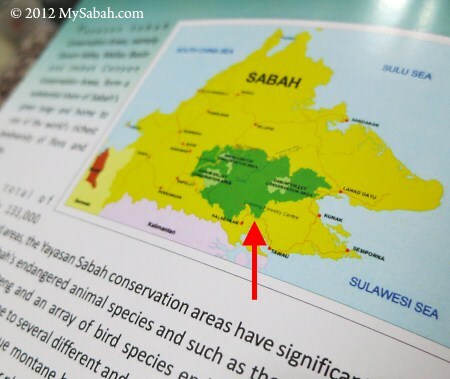 Anyway, no matter what will be the outcome, Sabah will still carry on with the conservation of DaMaI. 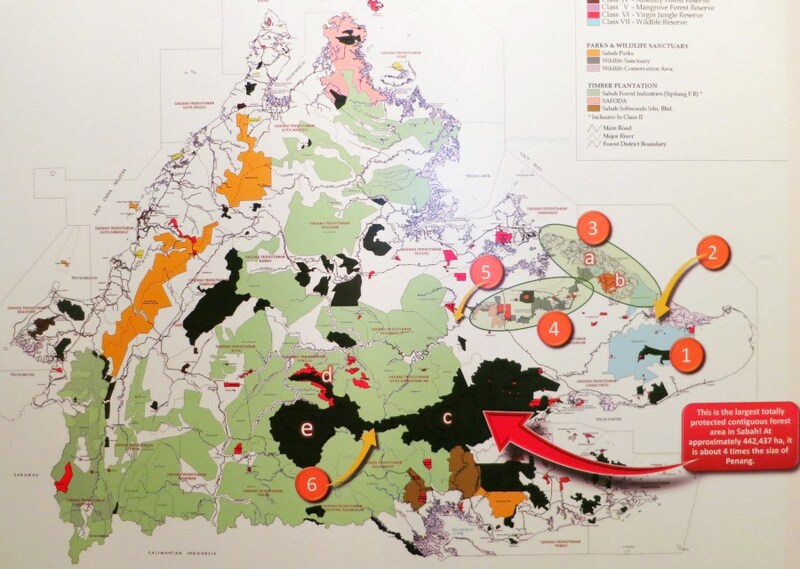 In Aug 2012, Sabah Forestry Department re-gazetted 183,000-ha of Class 2 Commercial Forest (for logging & plantation) into Class 1 Protection Forest. Class 1 means fully-protected forest, no logging, no oil palm and no hunting is permitted. Fragmented forest has been the biggest challenge for conservation in Sabah. The extra forest is really a great news, as it will link up Danum Valley, Maliau Basin and Imbak Canyon, and create a Corridor of Life for wildlife to migrate freely among these forests for more food and resources. This move is in line with Heart of Borneo (HoB) initiative, which involves Sabah, Sarawak, Brunei and Kalimantan (Indonesia). 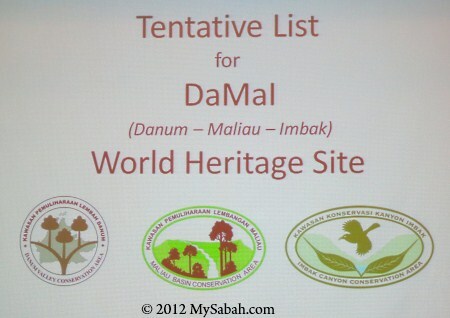 If DaMaI is inscribed as an UNESCO World Heritage Site, it will become the property of the world. It is a sacrifice for Sabah. More $$$ for ecotourism? Well, to be frank, logging and oil palm can generate more income than tourism. If the future generation can read this post after 20 years, please remember we work hard today to keep this Borneo green lung for you.